1.Take a small box. Cut any flaps off the box. Trim the tubes to size so that they are a couple of inches taller than the box. Glue one tube into each corner. Leave it for dry. 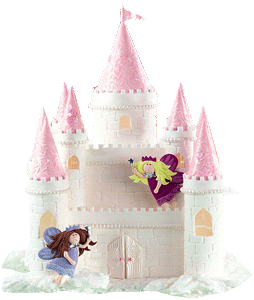 2.Paint the castle in either pink or purple paint. Leave it for dry. Take the card and cut out two side plate sized circles. Cut the circles in half to make 4 semi circles. Roll the semicircles into cones and tape to secure. These should be placed onto the towers as roofs, so that they become “lids” to the containers within the towers. 3. For the door way / front tower, draw a rectangle as tell as the box and about 21 inches wide, with an arch at the top and cut out. Glue the front tower to the middle of one of the wide sides. 4.Take a black pen and draw windows and doors on the castle. Use glitter, sequins , pens and any other embellishment to decorate. 5.Now you can store pen and pencils in the towers and your pencil sharpeners and erasers in the base on the castle.